The enumerator for the Derbyshire part of the village (mostly Appleby Magna) was Edwin Hague who was the English Master of Appleby School from 1838 to 1863. He had previously been appointed Writing Master, in 1816, at nineteen years of age (1). By 1841 he would have known the village and its inhabitants well. 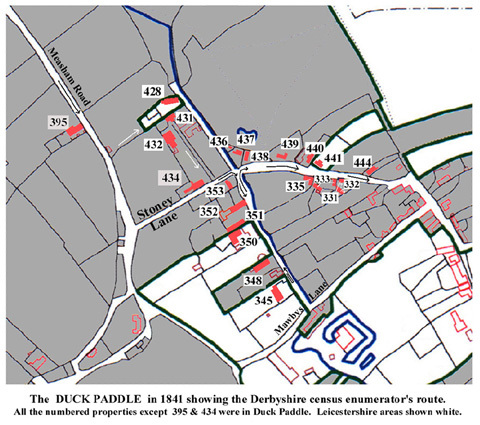 He commenced his route at Bowleys Lane, visited the outlying properties along the Tamworth Road from Little Wigston and Appleby Fields to Birds Hill; then re-entered the village along Measham Road, taking in Old End and Stoney Lane and covering the large area then known as Duck Paddle. It is apparent that making the superficial assumption that Duck Paddle can be identified with the modern Duck Lake is quite misleading. As we shall see, the enumerator included within it the present-day Old End and much of Black Horse Hill (2). The rest of Mr Hague’s itinerary, which I shall deal with in the next and final part of the 1841 census, covered Mawbys Lane, the Rectory Lane area and Church Street down to what is now called The Charter House. As explained in Part 1, the locations of householders are deduced by comparison with the 1831/32 Reference and Map of the village (3). The key to the properties given below in square brackets gives [1831 Ref. No., Type of property, Owner/s]. The squire George Moore is abbreviated to GM and ‘ag lab’ means agricultural labourer. Own indicates owner-occupier. References to the Notes are in bold type eg (1). Edwin Hague’s first call was at what is now Bowleys Farmhouse, [150,H+ carpenter’s shop, Own]. James Bowley (aged 55) joiner lived here with James (30); John (25) and Thomas (20) both “joiner’s J” [ie joiner’s journeyman or qualified assistant]; Elizabeth (20), Jane (21) and Elizabeth Bailey (2). Further along the lane, at the present Greycroft, [147,H,GM] was Edward Boden (35) malster with Harriet (35), Thomas [Rowland ?] (21) malster’s J., Thomas Bowley (15) malster’s apprentice and four young servants Edward Radford (14), James Broughton (12), Maria Jones (12) and Ann Atkins (10). In 1831, Little Wigston, at SK 305 099, had 3 cottages alongside the Tamworth Road with buildings and a croft [88,3c, John Radford], with ‘several occupiers’, unnamed. The map of 1838 shows a similar situation (4). By 1841 however there were eight households on this part of Tamworth Road suggesting that new houses had been built. In fact two extra small terraces survived until the building of the M42 motorway (5). The eight cottages listed are presented in two groups of four households with the first of each group (ie two altogether) unoccupied. It is difficult to work out how this can account for the original cottages plus two new blocks. Maybe the original cottages were temporarily unoccupied and the enumerator did not record them. But there can be no doubt that those listed here were in Little Wigston. The first group of occupants were John Radford (55), ag lab, with Elizabeth (50) and three boys; Mary Plant (25) poor widow with three girls; and Joseph Blake (20) ag lab, with Ann (20) two girls, Sarah Wallace (30) & Harriett (10). The second group were John Passam (70), ag lab, with Elizabeth (55) and Elizabeth (15); John Wilson (30), sawyer, with Elizabeth (35) and six children and; George Beck (40), ag lab, with Mary (35), Amy and Ann (both 15) and William (11). On the corner of Ashby-Tamworth and Burton-Atherstone turnpikes stood the Red Lion Inn, also known as Appleby Field(s) House [90,Inn,GM]. In 1839 the Dart stage-coach, travelling along the Ashby to Tamworth turnpike, picked up and dropped passengers at the Red Lion (6) (7). Here in 1841 lived Samuel Cotton (40), publican, with Lucy (40); Susannah Jones (45) and Lucy (15); five young servants and William Pratt (40) ag lab. The name Appleby Fields derives from the old Open Fields. Before the enclosures of 1772, travellers coming along the highway over the Great Heath on Birds Hill or over No Mans Heath from Tamworth, here entered the cultivated lands of Appleby’s old field system (8). A new house had been built between 1831 and 1841 just to the north-east of the cross-roads on the Stretton side at SK 310 104 [79a,H,Henry Baker] (9). This was later known as Heath House. In the days of the Open Fields, there was a pocket of heath or common land here (10). In this house in 1841 lived Joseph Adkins (30) servant with Rosalia (30). In 1831 just across the road towards the village, at SK 311 103, was a cottage, occupied by E Boden, with a brick kiln and yard [379,c,GM]. In 1841 this was not recorded, the brickyard cottage apparently abandoned. Further to the north-east the old Workhouse [412,Workhouse,GM] at SK 316 109 was no longer there, having been demolished before 1838 (11). Across the fields towards the Measham Road at SK 316 107, lay a pair of cottages [417,2c, Revd Alfred Smith] (12). One cottage was occupied by William Spencer (45), ag lab, Mary (45) and 3 sons. In the other lived Thomas Ad(t)kins (35), ag lab, with Elizabeth (35) and 4 children. At the baptism of his younger children (from 1839) Thomas was described as a sawyer (13). 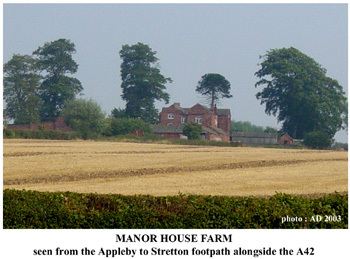 Another new property in 1841 was Manor House [65a,FH, Bosworth School] at SK 315 112, occupied by Frederick Frith (40), farmer, with Ann (65), Philip Needham (11) and four servants, 2 male and 2 female. Land in this part of the parish was awarded to Bosworth Grammar School in the Enclosure Award of 1772. The Bosworth Trustees’ entitlement arose from the school’s endowment of land at Appleby in the early 17th century (14). The estate was formerly Appleby Magna Manor and the Moat House is the remains of the old manor house which the new house replaced and from which it takes its name (15). Remote, under the hill and near the River Mease, lay a cottage with yards and buildings [5,c,GM], at SK 316 118. The occupant in 1831 was ‘Hall’, which may simply mean that the squire had possession. In 1841, the cottage was unoccupied, perhaps now abandoned, but the farm buildings remained well into the 20th century. On Birds Hill at SK 324 114 was a cottage [42, c, GM] where, in 1831, Miss Brown lived. In 1841 it was probably occupied by William Blastock (40), grazier, with Mary (30); and Thomas Blastock (35), cow dealer. Higher up the hill at SK 323 113 was a house with gardens and buildings [43,H,GM], in 1831 occupied by a Mr Pickering. In 1841 the occupier was probably Francis Wrightson (55), independent, with Mary (50), James (5) and Caroline Warton (55). Modernised, both of these properties can still be seen on Birds Hill. The name Side Hollows can be traced back to the 15th century, although the present farmhouse appears to date from around the time of the Appleby enclosures in the late 18th century (16). In 1841, as in 1831, the occupant of the farmhouse [36,FH,GM] was George Timms (30); in 1841 with Ann (25), baby Sarah (7 months), and four young servants. Across the road from the farm entrance is a small terrace of three cottages [547,4c, GM] which housed weavers who were probably working at home. In 1831 the listing of this group as four cottages, may well include the tollgate cottage standing close by (see below). In 1841, the three weavers’ cottages were occupied by Joseph Lunn (35), licensed hawker, with Sarah (40) one boy and six girls; William Taverner (60) ag lab with John Taverner (20), cotton weaver, Jane (20) and two younger Taverner children; and Benjamin Lunn (35), Idiot [?- word crossed out], Isaac Lunn (25), weaver, and George (20). The tollgate and cottage were situated just below the entrance to Side Hollows Farm driveway very close to the weavers’ cottages (17). The occupant of Birds Hill Gate in 1841 was William Plant (30), ag lab, with Sophia (30) and three children. There is no mention of a toll-collector. The White House [517, H, Mrs Moore [crossed out] GM] was one of the Moore family residences. The occupants in 1841 were the unmarried uncle and aunts of the young squire George Moore at Appleby Hall: viz. John Moore (50) independent, Catherine (65), Elizabeth (60) and Mary (60). With them was Francis [sic] Smith (65) [female] independent and they were supported by 4 male and 9 female servants. An unoccupied dwelling was also recorded with the White House (18). Nearer the village stood a group of four cottages [395, 4c, John Moore Esq] (see the map below) now Nos 31 & 33 Measham Road. These were occupied by James Smith (40) ag lab with Elizabeth (40), 5 children and Arrabella Karey (75); Catherine Taylor (50) poor widow with Francis [sic] (25) [female] , mantua maker, Ann Hill (20) and Catherine Taylor (20); Thomas Smith (30) ag lab with Elizabeth (25), William (7) and Elizabeth Dawkins (60); and John Garratt (55) ag lab with Jane (50) and two boys. Edwin Hague, the enumerator, clearly used the footpath from Measham Road to get straight to the bottom of Old End (see the map for his progress). 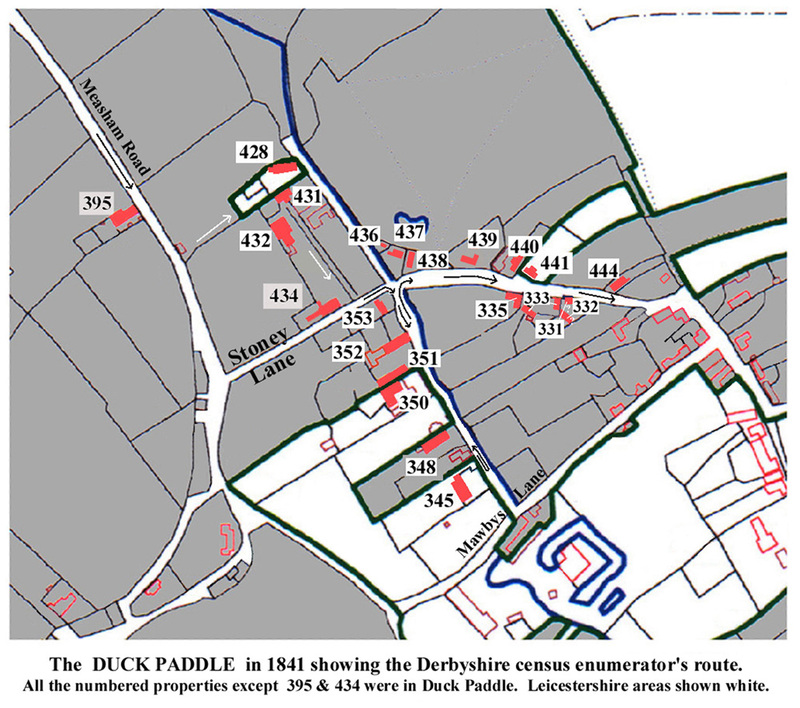 Here he began to record properties under the heading of Duck Paddle starting with the four cottages [428, 4c, Miss Sarah Hear], occupying a small pocket of Leicestershire. The occupier of one was Richard Spencer (50) ag lab with Mary (45), William (25), 5 younger Spencer children and Mary Johnson (11). Another was probably occupied by Thomas Haywood (30) with Charlotte (35) and 4 children. The two others were unoccupied. These cottages have not survived. One of the two neighbouring Derbyshire cottages [431, 2c, Jno Wyatt] was occupied by John Wyatt (70), custom weaver, with Mary (55), John (30) grocer, Sarah (20) and Thomas (15). The other occupant was probably James Shaw (30), independent, with Julia (30) and 2 children. By 1847 a third cottage had been added and the three are now one house known as Brookside, 21 Old End, (19). Nos 15 and 17 Old End did not exist in 1841. They may have been converted from, or replaced, the farm building shown in their place on the 1832 map. Next came a house [432, H, self] occupied by Elizabeth Harrison (55) with Richard (20) and John (20), joiner. This house is now No. 11 Old End. Another Elizabeth Harrison (60) independent lived with Elizabeth (15) in one of three cottages which she owned in Stoney Lane [434, 3c, Own]. George Godfrey (65), painter, lived in another with Frances (60), Thomas (25), joiner, and Maria (20); and the third was probably occupied by William Wyatt (25), shoemaker, with Elizabeth (25) and two children. Nos 1, 2 & 3 Stoney Lane now occupy this site. On the corner of Stoney Lane and Duck Lake stood a cottage [353,c,GM] occupied by William Bates (45) tailor with Mary (45), Eliza (20) straw bonnet maker, John (14) tailor’s apprentice, 3 other children and John Parker (40). 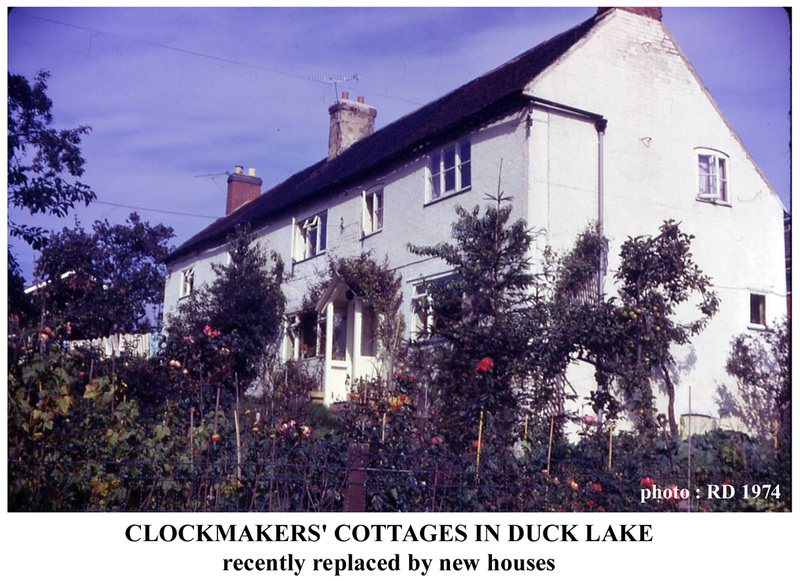 The enumerator now called along Duck Lake itself, breaking off at one point to go back to two cottages on the corner of Old End and Black Horse Hill. First along Duck Lake were 3 cottages [352,3c, GM]. Two were occupied by: Charles Godfrey (50) brick-layer with Hannah (55) and 2 children; and Hannah Plant poor widow living alone. The third cottage had two families: Joseph Henshaw (60) ag lab with Mary (35) and Joseph (12) ; and Joseph Harris (35) with Mary (30), 2 children and Ann Hutchins (55). Next came 2 farmhouses. The first [351,FH,GM] was occupied by George Marshall (60) farmer with Hannah (55), Ann (30), George (25) farmer, Thomas (20) stay maker and Mary (15). The farmhouse next door [350,FH, Nathaniel Tunnadine] was in Leicestershire (see map) and occupied by James Tunnadine (50) and 2 servants: Oswald Bowley (25) and Jane Gamble (20). Nathaniel Tunnadine had died in 1835 so in 1841 the owner was probably his son James. This farm was later known as Duck Lake Farm. Most of the old buildings in this area, except  below, were demolished to make way for St Michaels Drive. Returning to the corner of Old End there were 3 cottages [437,3c,GM], now No 30 Black Horse Hill, one of which was occupied by John Bakewell (45) staymaker with Sarah (45) and 2 children. William Smith (40), although listed before the Duck Lake farmhouses, may have lived with Ellen (30) and seven children in one of the others; and the third appears to have been empty. In the cottage next door [436,c,GM] lived Thomas Healey (60) shoemaker with William Copestake (15) shoemaker’s apprentice and Mary Copestake (60) who had been the occupant in 1831. William Spencer (45) ag lab, recorded next, with Sarah (45) and 2 children was probably next door in one of the pair [438,2c,Sarah Armstead], now No 26 Black Horse Hill (the enumerator returned later to the second cottage - see below). Back along Duck Lake, the enumerator next visited a pair of cottages [348, 2c, John Moore Esq]. In the first of these lived William Smith (65) ag lab with Mary (65), Sarah (25), Henry (10), Amy Baker (75) and Job Staley (25) potter. Amy Baker was the widow of Henry Baker (1761-1826) clock-maker and this property was later occupied by George Reeves also clock-maker (20). Four modern houses now stand on this site. The second cottage was occupied by John Chandler (45) farmer with Mary (40) and John (14). The next cottage, in Leicestershire, [345,c, GM] was occupied by James Toon (30) ag lab with Mary (30) and 2 children. Enlarged, this survives as No 1 Duck Lake. Having completed Duck Lake, Edwin Hague, the enumerator, began to move up what we now call Blackhorse Hill, starting with [439, H, Own] occupied by Mrs Mary Mould (55) independent with Ann (25) and a servant Ann Jackson (15). This is now Homeleys, No 24. He then went back to the second cottage of [438,2c,Sarah Armstead], now No 26, where Joseph Armstead (25), independent, lived with Sarah (50) and Elizabeth Peplow[?] (45) a servant. The first houses on the other side of the road were 3 cottages [335,3c,Thos Pratt] later No 19 (- 23?). One occupant was Thomas Pratt himself (40), independent, with Mary (35). The other two were probably occupied by Jane Bowley (50) charwoman with Charles (10); and Leonard Wykes (55) ag lab with Harriet (45) and 3 children. Next, he probably called at [441, c, GM] (on the east side in Leicestershire) where the occupant was Thomas Saddington (30) butcher with Ann (30), Edwin (3), Emerly (sic 9m. ), Zencorah Tipper (5) and a servant Sarah Dymmeck (15). In the house next door [440,H, Own] Miss Frances Godfrey (50), independent, lived alone. Nos 20 and 22 occupy these plots now. Over on the west side of the road was a group consisting of the wheelwright’s house and 3 cottages [333,H+3c,GM]. The cottages were set back behind the wheelwright’s shop. In one lived Thomas Whewell (50), ag lab, with Catherine (50), John (25) ag lab, Mary (30), Thomas (10 m.) and George Collier (22). The others were probably occupied by Joseph Beadman (35), sawyer, with Catherine (30) and 6 children; and William Stretton (30) ag lab with Jane (40) and Catherine (1). 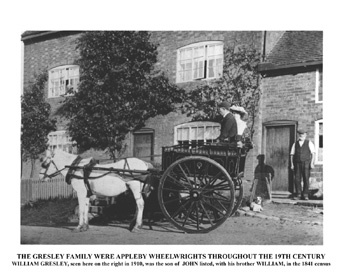 In the house, now No 13, lived William (25) and John Gresley (20) both wheelwrights (21). No 11 Black Horse Hill appears to be the remnant of a group of three cottages [332,3c,GM] with a separate cottage [331,c,Own], perhaps situated closer to the lane (the 1832 map is difficult to sort out here). The single cottage was occupied by William Glenn (60) with Sarah (65). In the first of the 3 cottages  lived William Bates (50) tailor with Sarah (50). One of the others was probably occupied by Ann Wilkins (50) poor widow with Catherine (9); and the third was empty. Just a little higher on the opposite side of Black Horse Hill stood a pair of cottages [444,2c,Mrs Jones & James Parker]. These cottages, now Nos 10 and 12, were the last properties listed in the Duck Paddle. They were probably occupied by Ann Tunnadine (50) independent with Joseph Wilson (40) bricklayer and Elizabeth Fish (20) a servant; and Mary Pass (50) poor widow living with John (9). The properties higher up the hill were listed under Over Street - a northern extension of what we recognise today as Top Street. The final leg of the census will begin there. 2. 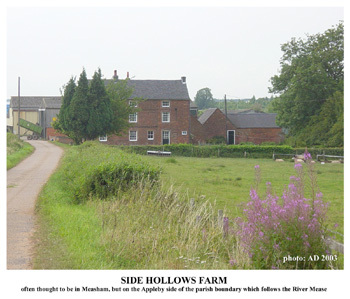 Aubrey Moore, in A Son of the Rectory, Alan Sutton, 1982, p87, describes Ducklake as a ‘general area from Rowlands Farm [ie Homeleys Farm on Black Horse Hill] along the brook ... the name not being confined to any particular road’. 3. Map of the Parish of Great and Little Appleby in the counties of Leicester and Derby, 1832 and Reference to the Map of the Parish of Great and Little Appleby in the Counties of Derby and Leicester, 1831, Trustees of the Sir J Moore Foundation. 4. Map of the Parish of Appleby Magna, 1838 (showing the complex county boundary line). Grateful thanks to Mr Charles Ward for allowing access to the map. 5. The two new terraces at Little Wigston were at right angles to and set back from the Tamworth Road. 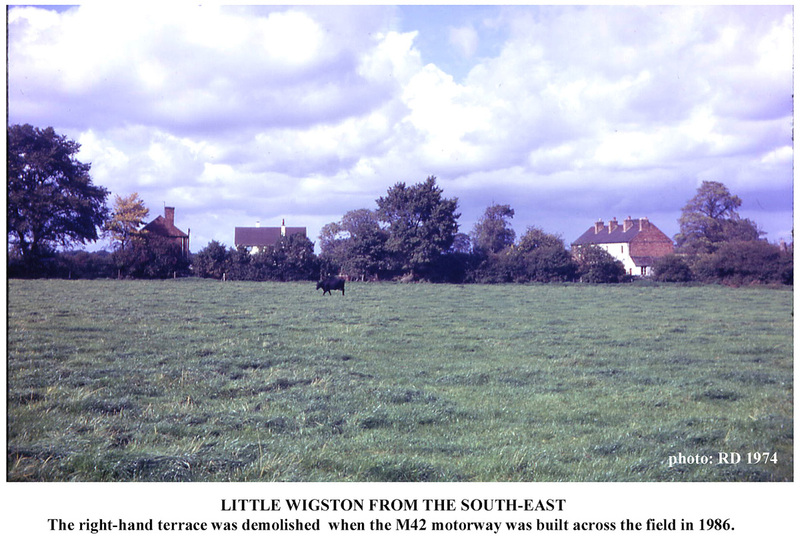 One terrace was demolished c.1986 to make way for the M42 north-bound exit slip-road. The other block survived and was converted into a single house. The original three cottages alongside the old Tamworth Road also survive. 6. The enumerator called this Appleby Field House, a name echoed later in Appleby Fields Farm. In 19th century directories, Glover (Derbys) 1829, White (Leics) 1846 and White (Derbys) 1857, it was the Red Lion Inn. The inn must have provided a convenient coach halt or ‘stage’ at the crossing of the Burton to Atherstone and Tamworth to Ashby turnpikes. In May 1839, James Tunnadine recorded in his Diary that he returned to Appleby from Birmingham on the Dart stage-coach. I am grateful to the late Mr Gordon Parker for generous access to the diary. 7. 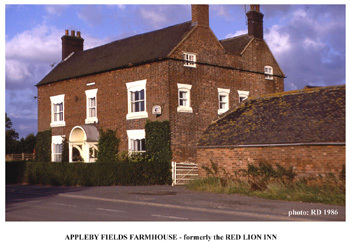 The farmhouse was demolished c.1986 to make way for Appleby Service Station at the motorway junction, so the site of the Red Lion Inn once again caters for travellers. 9. The 1831 Reference, against No 79, has in pencil: A New House to be marked on. Inserted between the lines, also in pencil, is 79a House Buildgs Yd & Gdn; and in the margin: New man - possibly Joseph Adkins. 10. A length of common land lay on the north-west side of Tamworth Road - see my map of the two Clay fields in In Focus 9. Heath Lodge, a modern bungalow, now replaces the old house. 12. The surrounding enclosures were known as First, Second... &c Smiths Close. 14. In Focus 11 (Bosworth School endowment). 15. Manor House must have been intended as a replacement for the Moat House, but located on the new farm. It is fortunate that the old building survived. 16. In Focus 9. The name may be found as the name of a furlong (group of land strips) in early glebe terriers, eg Sydhallo (C15); sydehollow (1638). It may well originate from the hollow shape on the hillside above the farm. The C18 farmhouse appears to have been extended by one bay at the north end. 17. The tollgate is marked (T G) on the 1st Edition 1 inch OS map. A painting , dated 1806, of Measham from Birds Hill by L Villiac, a Napoleonic prisoner of war, shows the weavers’ cottages and the tollhouse and gate in the right foreground. See Measham in Focus ed. K Elliott & J L Salter, Leicestershire Libraries, 1992. 18. In Focus 13 (White House). Mrs Moore, the squire’s grandmother, continued to live at White House until her death in 1834 (her name is crossed out on the 1831 map reference). The empty dwelling of 1841 may have been her separate quarters. 19. The first cottage was acquired by John Wyatt in 1808 from the widow Mary Hear. Mrs Hear’s daughter Sarah owned the adjacent cottages  in 1841. Wyatt added a second cottage before 1841 and a third just before 1847 when he died. His estate included three cottages, the third being newly erected. Mutual rights to use the well and roads of the premises show that the three cottages stood together. I am indebted to Mr John Addenbrooke for this information. 20. Joan H Dunmore, The Baker Family of Appleby, 18th & 19th Century Clockmakers, Hinckley Historian, 20, Autumn 1987. It is not clear whether this was the only site of the clockmakers’ workshop. No family connection has been established between the Baker and Reeves families.